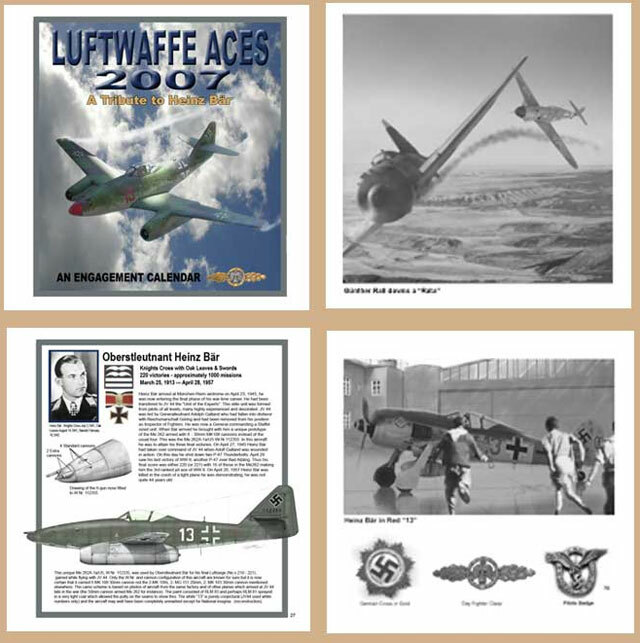 Description and Publisher’s Details: "Luftwaffe Aces 2007 - An Engagement Calendar"; self-published by Virgil O’Neil, email virg@vcn.com . This is Virgil O’Neil's sixth annual engagement Calendar on a Luftwaffe theme. This year's calendar is dedicated to the theme of Luftwaffe fighter ace, Heinz Bar. This time, the subjects and the colour artwork are devoted for the first half of the year to Luftwaffe Ace Heinz Bar, his missions and aircraft. Each month includes a text description of aircraft and operations, ranging from a Bf 109 E in the Battle of Britain to two Me 262s at war's end, plus a glossy, attractive colour profile. The remaining Aces pages follow the same format. The last five pages of the Calendar are five pages of attractive and convincing composite artwork. I always look forward to seeing Virgil's latest desk calendar, and this year's edition will be open on my work desk for 2007. "Luftwaffe Aces 2007 - An Engagement Calendar" will be an appropriate companion on the modelling bench or an appropriate gift for a Luftwaffe modelling fan, especially aficionados of Heinz Bar.